The GUI has been updated to a much user-friendly version. 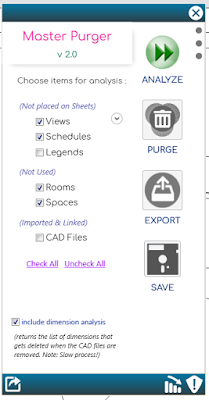 CAD files can be analyzed and purged. Legends which are not placed on the sheet can be removed. Export to CSV has been added. The results can now be exported to CSV for further analysis. "SAVE" feature is added. When the user locks a few elements and then use "SAVE" command, the data of the locked elements will be saved in the computer. When the user runs the analysis later, the saved data will be imported and locked status will be loaded. 1. Exporting to PDF has been discontinued. V1.1 - Added View Schedules to purge list. This tool also holds a new feature: Dimension Analysis, which analyzes all the dimensions present in the project. This Dimension Analysis will give an overview idea of all the dimensions that will be removed/lost after purging specific CAD files. Based on this result, the user can make a decision to purge the CAD file. Master Purger is brought to you by Hippo BIM. It's free.